If you’re looking for the most adventures available in one place, the Inn on Rupurara should be on your radar. 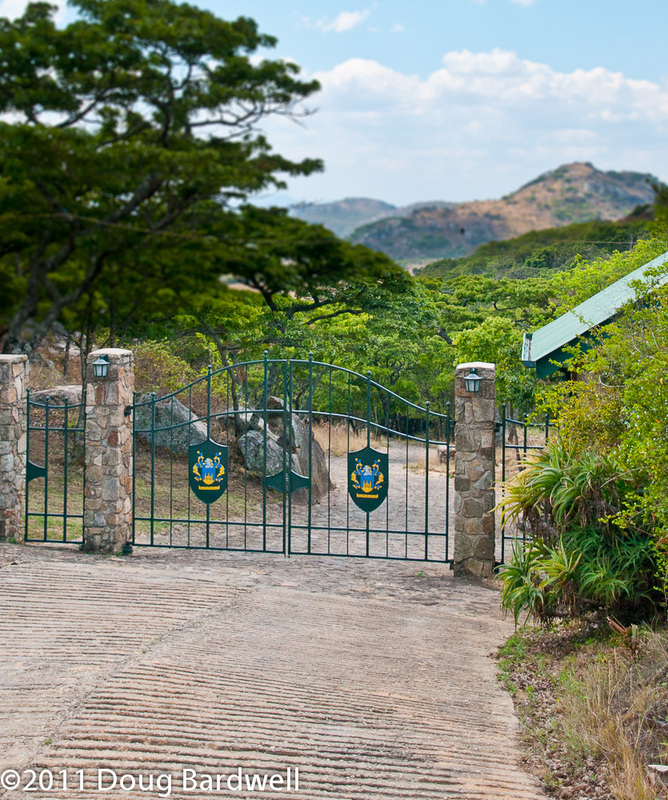 Situated in an area of Zimbabwe known as the Eastern Highlands, the inn itself is a green jewel in a necklace of scenic mountains. Passing through the big entrance gate, you sense you are in for a special experience and then looking at their activities board, you realize that you are going to need some time to take in all that the inn has to offer. We arrived late in the afternoon, which just gave us time to register and quickly head down for the scheduled game drive. Piling into a 12 passenger open safari vehicle, we drove down into a valley full of native flora with strange names and their beautiful blossoms. Heading up the steep climb on the other side of the valley, it didn’t take long at all for the wildlife to come into view. Rounding the bend in the road at the top of the hill, we came eye-to-eye with a herd of grazing zebra. Another 500 feet along the road, eland could be seen over the brush. Not much longer and impalas added their names to our checklist. 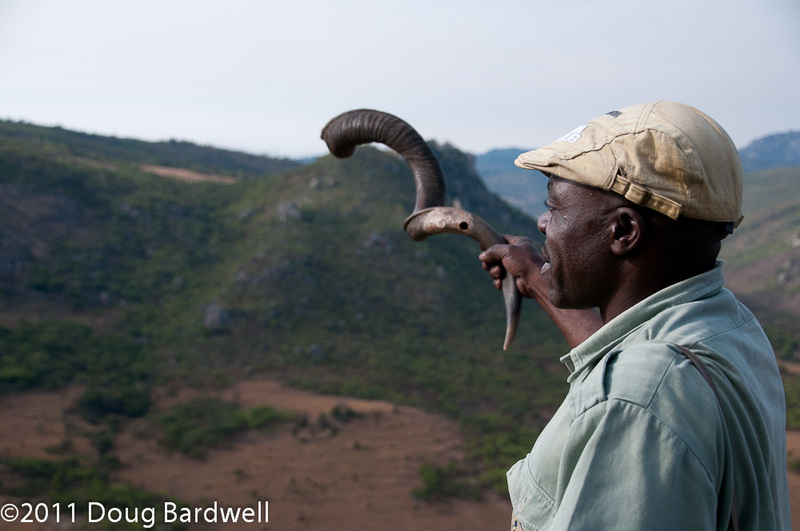 Cecil, our guide, pointed out how to verify an impala from the markings on their rear ends. Heading into a grassy plain, we brought our vehicle to a quick halt as two large wildebeest ambled across our dirt road. Seeming ambivalent to our presence, but somehow shy at the same time, they kept going until they were safely out of sight in a clump of trees. Animal sightings continued on a regular basis as we drove around a good portion of this huge game preserve. Heading back for dinner, Cecil wanted to check out a special group of Acacia trees where some of the resident giraffes liked to hang out. Approaching the grove of trees, all we could see were the legs and bellies of the giraffes. Cecil parked our vehicle and jumped out, heading into the Acacia grove. 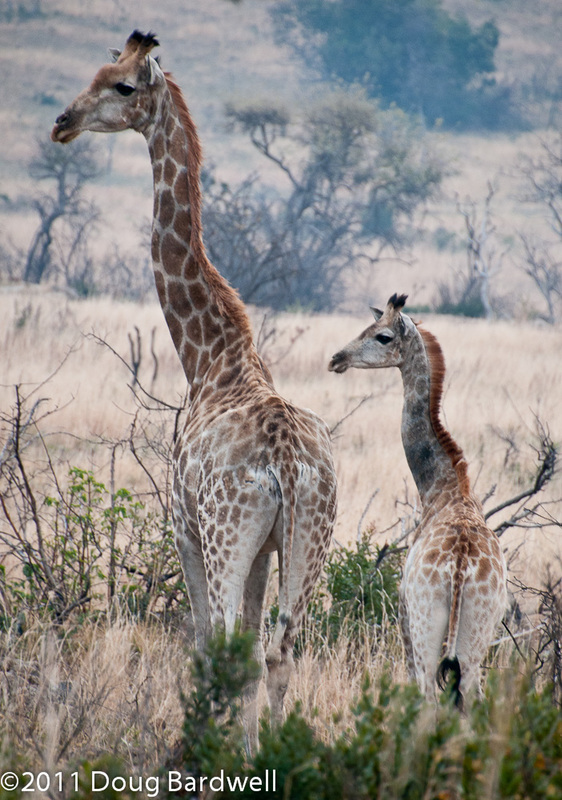 With a little good-natured coaxing, the giraffes came out for their photo session. Mom, dad and baby all made for great photo subjects in the setting sunlight. After posing for maybe 5 minutes, they returned to their favorite food source and continued their dinner. It was dinner time for us as well and we returned to the inn. The Inn on Rupurara is cut into the side of one of the many hills of the Eastern Highlands of Zimbabwe. With such a dramatic setting, the owners were careful to utilize as many natural materials as possible in the construction of the lodge. Rugged stone walks and steps guide you to individual lodges overlooking the valley we had just driven through. Staff from the hotel carried our heavier bags as the frequent stone steps and wooden bridge made the long path to our room a bit of challenge in the fading light. Inside the cabin was a wonderfully furnished room overlooking the valley. An outside deck with comfortable chairs and the fresh evening air just begged to be utilized. Eighteen lodges dot the hillside. 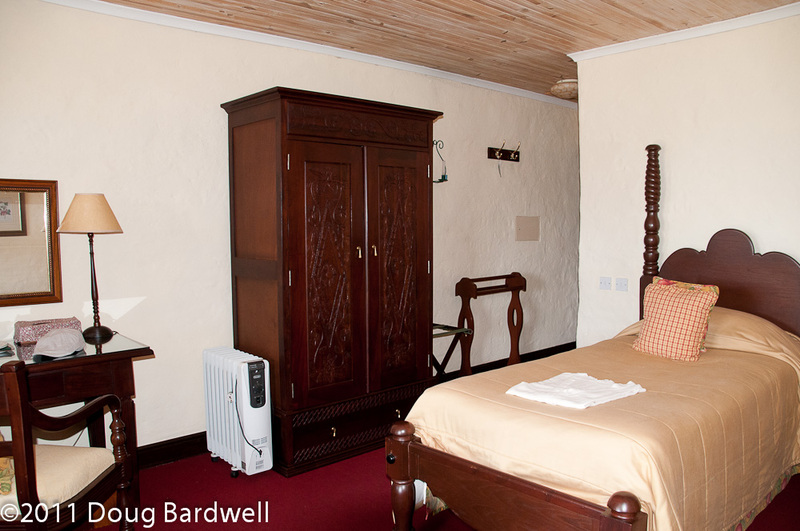 Each lodge is spacious and the beds are comfortable. Each is furnished with period wooden furnishings. In addition to the bed(s) there is a desk and chair as well as an overstuffed easy chair. The baths are large and have a full-sized soaking tub and a separate, tiled shower. The floor was a colorful tiled floral pattern. The dining area back at the main lodge was located on the second floor and offered both inside and outside dining. Inside, the dining area was a blend of warm wood tones and artwork. Food was plentiful and tasty, a perfect end for a fun filled afternoon. 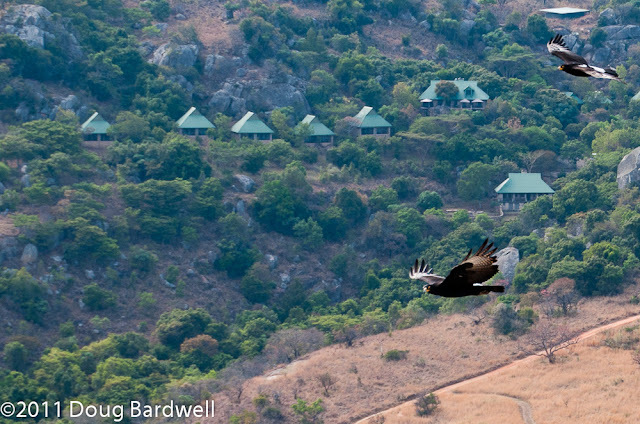 Internet coverage is spotty in the wilds of Zimbabwe and this was no different. From 7:30pm until 8:30pm we did get a good wireless signal in the lodge and we quickly checked emails before the signal and the lights started to fade by 10:00pm. By that time it was time to turn in for an early morning hike the next day. 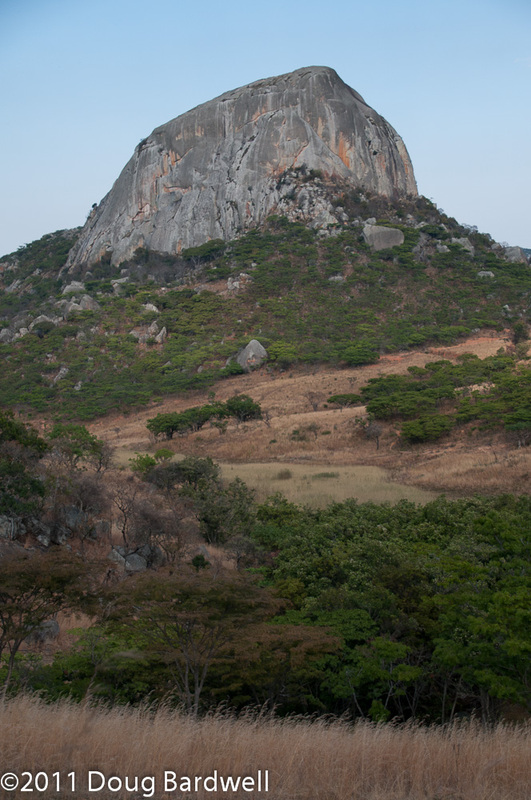 While on the game drive the night before, we had noticed this large boulder-like mountain hovering in the distance. Turns out this was Rupurara Rock, for which the inn had been named. In an otherwise level grassy plain, this monstrous 1,804 meter-tall rock juts up as though someone had slammed their fist up through the earth’s crust from the nether world below. 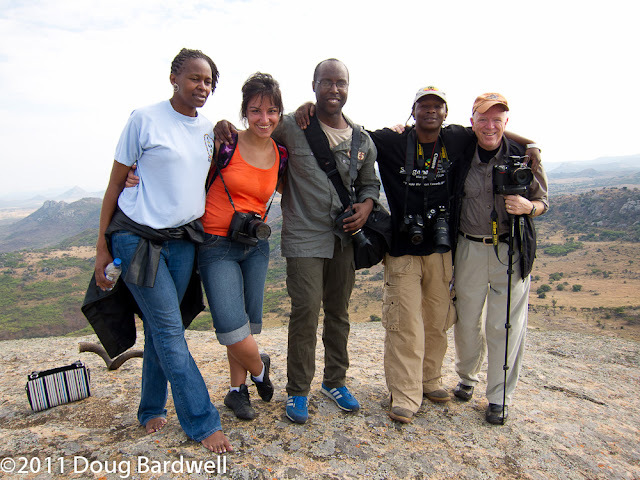 As the saying goes, “If there’s a mountain, someone’s got to climb it,” so a small group of journalists from around the world met at 6:00am to give it our best shot. We’re met again by Cecil, who has led this trek to the top 904 times. He’s even got one of the scenic overlooks named after him. Luckily for us, we get a ride to the base of the mountain on the safari jeep. That saved an hour’s worth of hiking right there, not to mention not having to dodge the wildebeest and eland with their twisty horns. From the shady western face of the mountain, we start our ascent. Much of the first portion is an easily traversed set of switchbacks with an occasional large boulder that must be vaulted up and over. Occasionally we’d see some of the bashful, furry creatures that live amongst the rocks. They were too quick to photograph though. Later we found a large millipede slithering across the ground which gave us reason to pause for photographs. Actually, we’d have been just as happy to stop and photograph dirt…we just needed to catch our breath. Cecil, at 70+ years old, was in far better shape than our traveling band of writers and photographers. Cecil paused at "Cecil's Overlook" while we worked to catch our breath. Pushing on, we eventually reached the tree line and were greeted with unobstructed views of the distant hills and a couple priceless hilltop homes. The ground at this point turned to 99% pure rock face. Only an occasional plant sprouted up in a rock crack and some lichen could be found growing on the surface. From here it was a constant smooth climb to the summit. Reaching the peak, a 360 degree panorama revealed itself with breathtaking vistas in all directions. Directly below, dozens of animals could be seen grazing on the grassy plains. In the distance, everywhere you looked revealed more mountain peaks. To our right, the Inn on Rupurara’s cabins could be seen dotting the hillside closest to us. Cecil had carried an antelope’s horn with us, all the way to the top. Upon reaching the summit, we discovered why. With great ceremonial flourish, he aimed the horn toward the Inn and began to blow. “That’ll let the cook know we’re coming in for breakfast,” he said with a smile. “Better hold those eggs” we thought, as none of us wanted to leave. If you are looking for a place to rough it (limited electricity and Internet) without having to rough it (comfortable beds and warm showers) or you’re looking for a place to enjoy good food with great views, you’ll want to consider Inn on Rupurara. Whether your idea of a good time is horseback riding up close and personal with the giraffes, or taking a hike to see ancient rock paintings, or trout fishing or bird walks, the Inn is happy to accommodate. To see my images from the Inn of Rupurara, click here to see the full slideshow.